Seven Dollar Sunday | Kaprise! This morning, I went on a whirlwind trip to Boston for just a couple hours. I left this morning at 6:45 and I was back home at 6:00pm. I met up with my cousin Jenny and we went on some retail therapy before indulging in some mimosas and brunch. Anyway… Jenny and I both bought these awesome eyeshadow palettes and eyeshadow brushes at Sephora for $7 each from the sale bin. I love the sale bins!! Jenny also got a hot pink lipstick for $3… such a steal! I also raided the Lord and Taylor Hosiery section and scored some lacy Givenchy tights. I paid $5 for each. I thought I’d share! This eyeshadow palette has an awesome mirror and it’s weighty, so it feels really nice when you use it. The quad is called “ballroom romance.” I tried to find it online, but it looks like this might be something that’s been discontinued. Might want to try stores to see if your Sephora has a sale bin with it! The pumpkin colors glides on shimmery gold, and I’m in love with this color for fall. 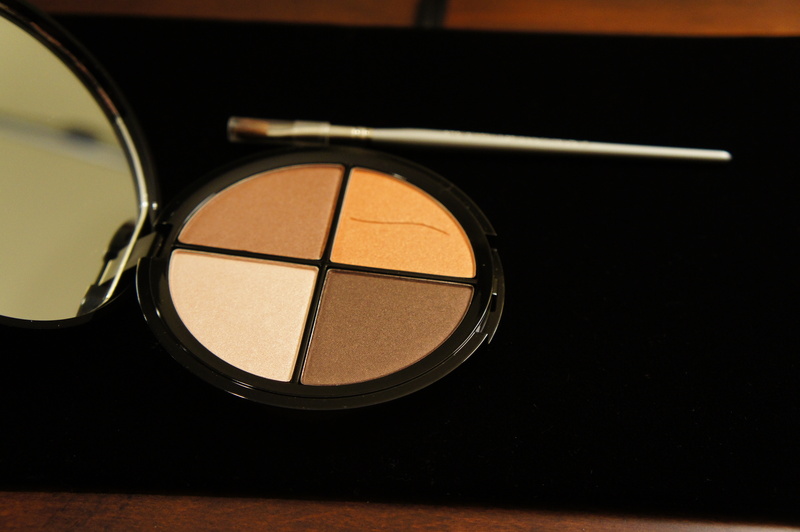 The two browns are perfect for a smokey eye combo… and of course the light color is great for highlight. The shadows are highly pigmented and beautiful. There were two other kinds, one that was purple toned and other with some brights… I wish I had gotten both. I might have to brave the hurricane tomorrow to see if my local Sephora has the other two. These are the tights! They retail between $16-$18 a pair, but I snagged them both for $10. The dotty one is called “Swiss Dot Lace Back Seam” and the garter-esque is called “Garter Net Tight.” I can’t wait to wear these this winter. Nothing like pretty and lacy tights to spice up otherwise boring outfits! I know this is a departure from my normal “thought” related posts or food posts… but with the impending winter and with my persistant unemployed status, I’ve been getting stir crazy. My shopping habits have been a bit out of control… so I’m trying to channel my nervous energy into blogging, sharing things, and making things. Back tomorrow with some more projects I’ve been working on.